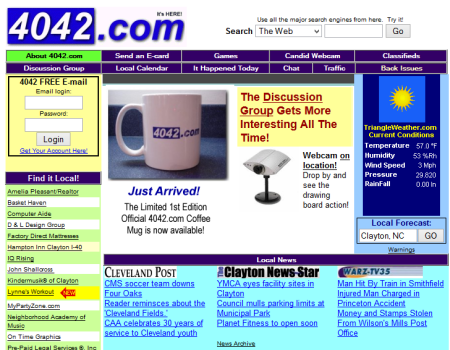 It's April 11th, 2000 and hyper local website 4042.com comes online. The name was originally selected because of the popular, centrally located intersection (40/42) that everyone in the county seemed to know. Covering all things Johnston County was the main focus - local news, events, people, discussion forums, classifieds. "Find it Local" was the mantra and over the years 4042.com became the place to find out what was happening anywhere across the county. From those early days, the site has grown substantially to the point where it consistently attracts 30,000 plus unique monthly visitors, generating an average 1.2 million pageviews. Now, here we are - over 15 years later! You are seeing a complete relaunch of the site with a new name: JohnstonCounty.Today The site is running on new software and new servers from which we will continue to provide all your old favorites, like FREE classifieds and neighborly conversations in the discussion forums. And, it provides us with a platform from which we can add additional features that have been in the works for quite some time. JohnstonCounty.Today - the heart of 4042.com with a new look, and a rededicated commitment to continue to be THE source for local information - All Johnston County. All the time. Thanks for joining us as we take things to the next level! Now, here's a quick rundown of what you can expect to find as you browse across the new site. Responsive - a great deal of the site makeover has been dedicated to making the new JohnstonCounty.Today display properly on full size desktop screens, tablets and smartphones. We know that a full 50% of our site traffic comes from mobile devices, and that number is growing each month. The new design ensures that you will enjoy your visit by fitting properly on different screen sizes. Local News - besides our own news and feature stories, we'll be scouring the web for news across Johnston County and aggregating it for you in one convenient location. Calendar of Events - we've gone all out on this one! Our mobile friendly calendar is THE single place to find out what's taking place in Johnston County. Fast, easy and free to add your own event at any time! Classifieds - our most popular feature has gone through a major upgrade. You can now manage all your ads from a spiffy dashboard. Your address ties in with Google maps, so your yard sales can easily be found. OH! Speaking of yard sales - the Classifieds now has a convenient map display. Quickly see the sales near you! And, a long time coming, you can now add up to FIVE pictures to your ad. The new system uploads and re-sizes them for you automatically! Johnston County Jobs - our new software makes searching for employment in and around Johnston County easier and faster. New jobs are added daily and you can use the extensive filters to help locate your perfect local job! Games - this section has had a MAJOR overhaul! You'll find your old 4042.com game favorites. Along with them, we have added several new titles. These new games will work on a desktop AND on mobile devices. We'll be testing and adding more as we move forward. Neat trick....if you view the games section of the site with your mobile phone, it will ONLY display those games that will run properly on your device - pretty slick, eh?! Contact Us - we wanted to make it quick, easy and simple to reach us about JohnstonCounty.Today. Have a problem with a feature? A general question? Want to provide feedback? We welcome your input - and you'll now find a CONTACT US link in the top, right hand corner on most every page of the site. It will open (in secure mode) our brand new Help Desk where you can open a ticket and we'll be right back to you! SiteLock - we have SiteLock monitor and scan JohnstonCounty.Today daily to ensure the site is safe and secure for our visitors. Doesn't that give you a warm, fuzzy feeling?! Quantcast - since 2007, 4042.com and now JohnstonCounty.Today has it's traffic independently measured and verified by a 3rd party organization - Quantcast. This is done to provide a transparent source of accurate information for our advertisers. Use the top menu bar you'll find on every page to explore the new look and features. That's the quick rundown - any questions, let us know!